How do I create a custom paper size for my product in Windows? You see the Main tab of your printer settings window. Select User-Defined in the Document Size drop-down list. The User-Defined Paper Size window appears. Note: If your product has multiple Paper Sources, the User-Defined option may not be available for every Paper Source. 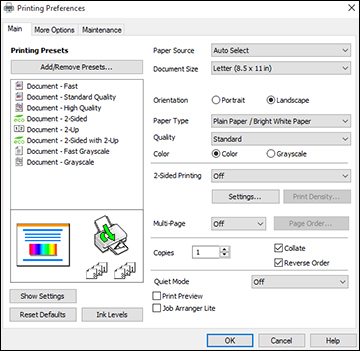 Enter a Paper Size Name and select the Paper Width and Paper Height. Click OK again. The new size is created, and you can select it from the Document Size drop-down list.